The offspring of Tubby and a stray female taken in by friends was off to the SPCA if he didn’t find a home. 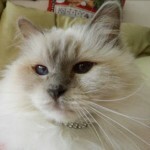 After meeting him we couldn’t let that happen and our love of all things cat was born! 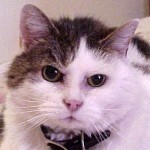 Skooter became famous in 1989 with his selection to appear on July 10 and November 22 in the “365 Days of Cats” calendar. Another kitten born to a stray rescued by a friend, she was not the kitten we originally chose but rather the one that selected us. Rather than joining “The Cat on My Head” club, Steamer was able to attach herself to any part of my body and move (without ever losing her balance) right along with me whenever I would roll over. 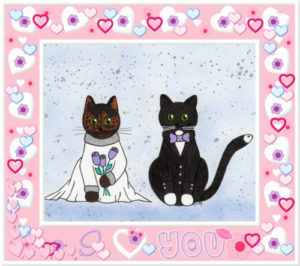 I had longed for a tuxedo cat and got my wish when a neighborhood stray, we eventually named “Mom,” deposited a litter of kittens in the engine compartment of my Mazda. The only long-haired cat among the litter, she stole our hearts. Another stray that found her way to our door, she arrived as we were leaving town for the weekend. She was still waiting for us on our return. Discovering she was in heat, she became ours after having her spayed. 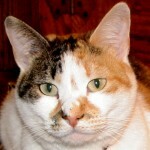 She taught us about the less than stellar personalities of calico cats. The last of Mom’s offspring was discovered after the neighbor’s caught Mom and had taken her to the SPCA where she was put to sleep. We were never able to train her wandering ways out of her and she is the only kitty we lost to the street. Each year, I put up a special Christmas tree in her memory and honor. “The Amazing Barking Cat” and second “Cat on My Head “ was liberated from a group of kittens that were always playing in the street a few blocks from our home. 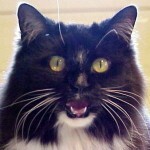 Her three, male siblings, Winston, Parker, and Sebastian, were liberated by a friend. 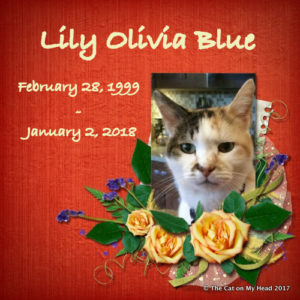 Lily Olivia was our “bridge” cat. She lived with all of our other cats, except Twinkle. The second “The Best Cat Ever!” hung around on our back deck for about six months before he was invited to join the family. Our vet said he was about two years old when he joined us in 2001. 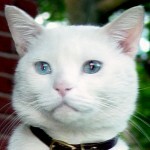 Though a white cat with blue eyes, Madison was not deaf. He had the best manners of any cat we’ve ever had proving to us that it is possible to train a cat not that we’ve ever had much success in this pursuit. 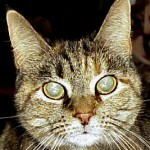 Originally named Cyrus, the marmalade cat I had wished for in 1997 was another stray. Adopted sight-unseen from a vet, we were surprised to find that he had ringworm and a hernia in need of repair when delivered to us. He became my shadow and followed me everywhere. Some experts say that cats don’t fetch. They have never met Mauricio who thinks such a game is perfect cat entertainment. Named for a retired Brazilian national volleyball team setter, he’s also a pretty good ball-handler. Misty May, the current “Cat on My Head,” is named after the famous Olympic Beach Volleyball gold medalist; though, she can’t be bothered with frivolous play. 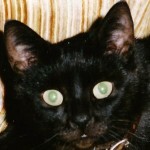 When it was time to add to the family after Daphne’s passing, I vowed to get only one kitten—a black, short-haired female as I was still missing Thelma. A friend sent me to see a couple of litters she knew about and I immediately fell in love with a grey, long-haired beauty and then her doe-eyed, short-haired sister. Tom was just returning from a trip to Italy, which included a visit to Juliet’s balcony in Verona, and so Giulietta seemed like one perfect name. 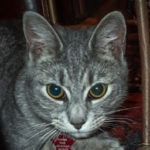 To see a short video of our talented kitty, visit YouTube and search for “Giulietta the cat speed reads on the iPad.” She has 61,500+ hits but would like to go viral. 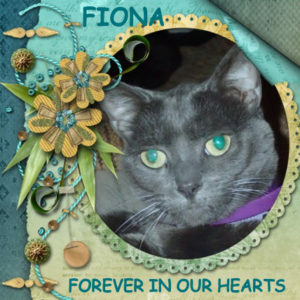 Named for a character on USA’s “Burn Notice,” Fiona, the velveteen cat, has channeled Thelma’s laid-back personality (my lap is her favorite resting place) even though she resembles Louise. These additions to the household are not related but were raised together. 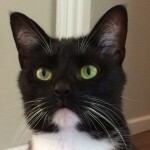 After being abandoned and bottle-fed, Astrid (originally Tabitha) was placed with Lisbeth’s (originally Cary) litter and raised by her mother, Tuxie. 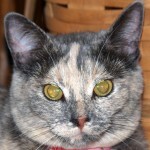 Named for a character on Fox’s “Fringe,” Astrid was adopted from the TNR/Rescue group, Barn Cat Buddies, in Hardy, Virginia. Lisbeth, named for the main character in the Stieg Larsson novels, was adopted from Roanoke, Virginia’s, no-kill shelter, Angels of Assisi. Another Barn Cat Buddy, this kitty came to us as Josette or Josie. The name Calista had not been on any of the kitty name lists I keep, but none of those names worked with Josette, which we wanted to keep for a middle name. 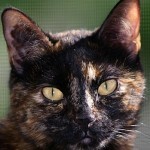 She is a dilute tortoise shell and one of four kittens born to a feral mother. She is the eighth cat in what is normally a seven kitty household. We’re hoping she doesn’t upset the applecart. Time will tell. 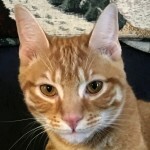 Five weeks after our precious Fiona received her wings, she brought us this adorable ginger tabby. Left to fend for himself in a snowstorm, he came to us by way of a friend who could not invite him in because of her three dogs. After posting him as found all over social media and finding no matches to lost cats, we had him scanned for a microchip. 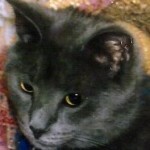 Finding he had none, Cooper Murphy joined the ranks of Kitties Blue at an age of about 15 months. He now has a microchip. SAWYER Gotcha Day 11/26/2017 (Vet assigned 07/01/2017 as birth date.) Housekeeper/Kitty Sitter Chris discovered this four-month-old, 3.9 pound, Manx kitten on the deck of the vacant house next-door to ours on Thanksgiving weekend. She began feeding him and set him up with warm blankets and a box on the deck. When we arrived home and found out, Dad Tom immediately retrieved him. By the following morning Tom had named him; his and our fates were set from that moment. 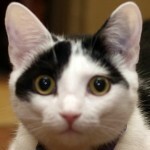 I did post some “found” cat notices on-line but received no replies. He became kitty number nine of the current residents, making for the most kitties in residence at any time. 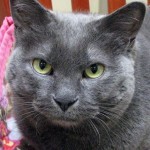 Over the years many other strays (Stewert, Noel, Skippy, Trouble, Alex and Teddy to name but a few) have asked for admittance, but, alas, had to find other homes. We are pleased that none had to go to the SPCA and all were placed in loving homes. 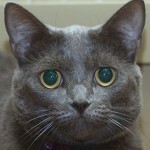 Lovely Nylablue joined us as an Honorary Kitty Blue on 6/14/2013. She and her mum live in Ontario, Canada. Nylablue was five years old in 2006 when she was adopted by Sherri-Ellen. 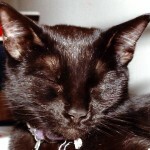 Her name was just “Nyla.” Nyla means Dark Blue in Sanskrit. Nylablue’s mum added blue to her name and she has answered to that ever since. Nylablue is a fan of Bollywood movies! 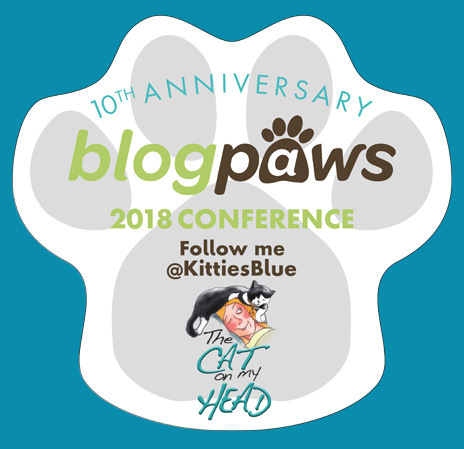 To learn more and follow Nylablue on her blog, you can find her at Nylablue and Sherriellen’s Purrfect Pad. 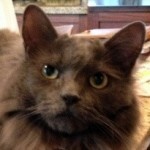 Bailey joined us as an Honorary Kitty Blue on 07/30/2013. We invited him as a gift for his second birthday. 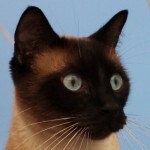 Bailey is a seal point Siamese who was born in the south of France. His human mom is Cornish and his human dad is an Aussie. 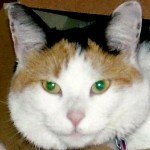 Bailey is the famous boat cat who sails the seas on Nocturne. Nocturne is docked near Rome. When not sailing, Bailey lives with his two woofie fursibs, April and Blue. 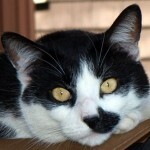 To learn more (if you don’t already know Bailey), you can find him at Bailey Boat Cat. 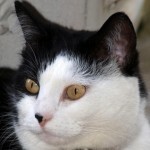 A handsome tuxie married to the beautiful Astrid, Sampson is a trouble maker, a food stealer, and a heart winner. He is a jack of all trades – a singer, an acrobat, a suckler (the neck is his favorite suckle spot). He is also a master conversationalist. Underneath it all though, he is one big lover boy, happy to spend his days cuddled up with his mom. 2. Get more belly rubs. 3. Get more treats and nip. 4. Always come when called unless napping, playing, eating, watching bird TV, day dreaming or participating in other cat-approved activities. 5. If in, demand to go out. 6. If out, demand to come in. 7. Don’t wash our butts in front of company unless it is an emergency. 8. Don’t eat Mom’s flowers when she’s watching. 9. Take up as much space in the humans’ bed as possible by sleeping east/west instead of north/south. 10. Clear the kitchen counters of all items whenever possible. 11. Pretend to be deaf whenever a human is speaking to us. 12. Always help Mom with her crossword puzzles and sudoku. But HOW did you get the beauties to sit so well for their portraits? I never could get any of mine to sit still for this! 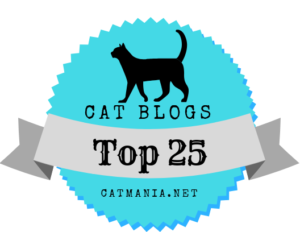 I was wondering if you heard of Cat Amazing? It’s an interactive cat toy I launched recently – it helps cats stay active and playing at home! Aside from providing indoor cats with enrichment, it’s also super eco-friendly and helps shelter cats across the U.S. through our Shelter & Rescue Enrichment Program. 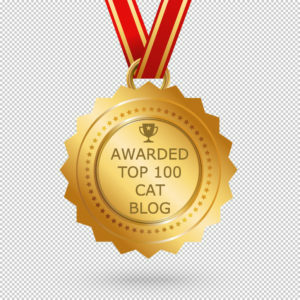 – Maybe just a link exchange for mutual SEO? – Or any other ideas you might have – I’m fairly new to the space, so would welcome any experience and guidance you could offer! 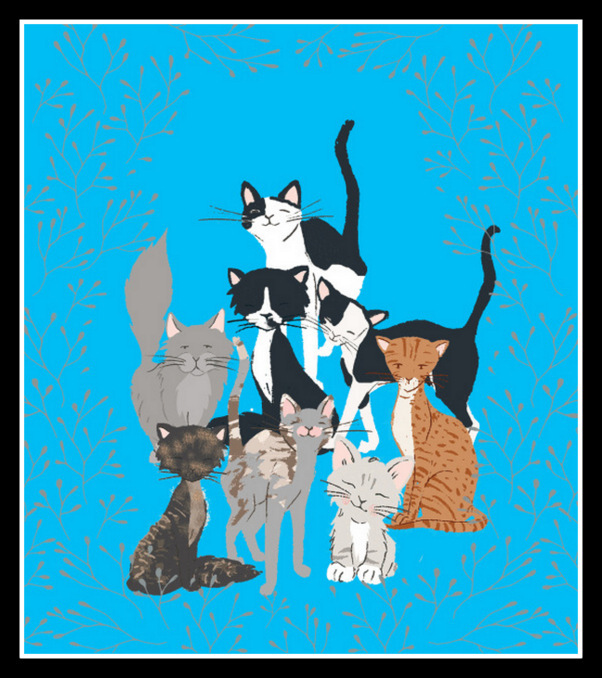 As a one-man startup, your help would be invaluable to getting Cat Amazing out to more cats to play with : ) I’d also be honored to send a Shelter Enrichment Kit to the shelter of your choice, to say thanks! Please let me know if this sounds like something you would be up for! What a fine album of fur people you have. We loved reading about all these great kitties. Obviously they are very loved and love their humans as well. It’s nice to meet everyone and to hear about those who are now angels. Great tribute! 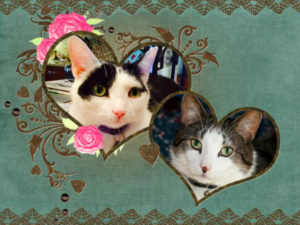 What a fine family Mau comes from…nice to meet everyone. I didn’t realize Sampson and Astrid were also an item. What a romantic family. 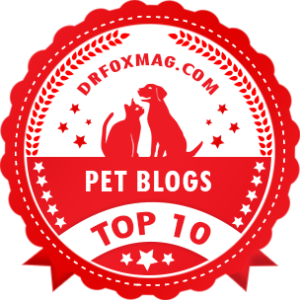 Jazzy, Truffie, Whisper, Shady Boudreaux O’Neill, Goldie, Callie, Midnite and Tabasco — and if that is not enough energy to keep everyone on their toes, we have puppy-energy too from Chloe and Utah!! How wonderful! I’m doing a similar thing with the many cats and dogs who have given me the privilege of living with them, but mine are too wordy. I love what you’ve done here, this is great! Meow!! 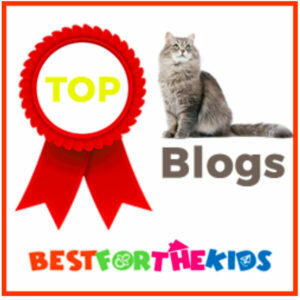 We have a page titled Mum’s Past 4 Leggeds. Not sure if you have seen it…there are a few still to add. Cats make the world a much better place, don’t they?? 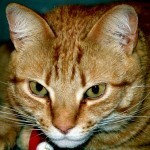 Hi, I tried sending you, Scout Mau’s Mum, a thought about Swizzle, and it bounced back. I had an idea about her toileting, is it potty? Please email me,and my 2nd thought is swizzle needs advertised also as a companion toca sisfurr or brofurr older than Swizzle, or her same age! Yow me iz an honorary KittehBlue!!! 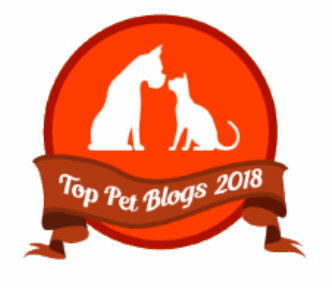 Diz iz lubly n pawsum n makez me have da leaky eyez…must be sumfing in dem…dust pirrhapz…Phank you Aunti Janet fer such an Honor…me iz humbled (as much as me can be, MOL). Me iz in pawsum company with yer beloved furkidz!!! 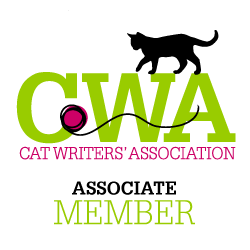 I am honored to say I am on a first name basis with all your lovely cats. You really have a lovely gallery to share with us. I’m always teary when reading about these graceful animals. Lots of memories and reflection going on in such moments. Thank you for being such a generous Mama to these kittos! What a great page, have enjoyed reading everyone’s stories. The Cat on My Head participates in Athena’s Caturday Art Blog Hop. 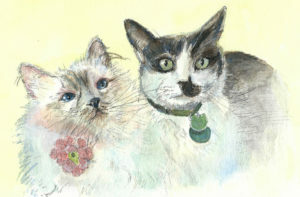 The Cat on My Head blog participates in the Caturday Art Blog Hop. 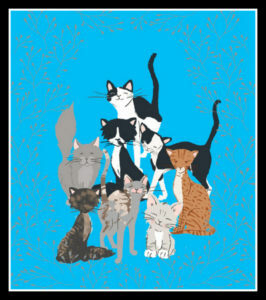 Kitties Blue promote honorary brofur, Bailey Boat Cat’s, new book. 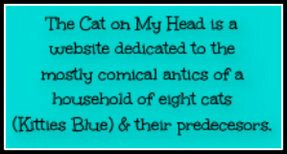 The Cat on My Head welcomes their third honorary Kitty Blue, Swizzle. 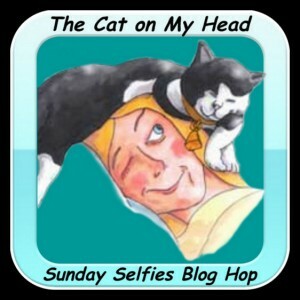 The Cat on My Head enters the Caturday Art Blog Hop with MacKenzie. Misty May is in pink for The Cat on My Head’s Sunday Selfies Blog Hop. The Cat on My Head’s Kitties Blue remember honorary sisfur, Nylablue. 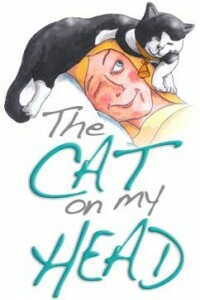 The Cat On My Head’s angel Daphne is featured on Throwback Thursday. 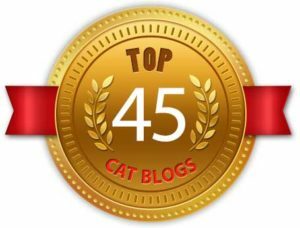 The Cat on My Head blog holds a comment-a-thon for Don’t Fry Day. 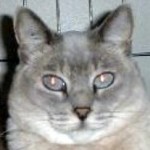 The Cat on My Head blog explains how some of their angels got named. Kitties Blue from the Cat on My Head honor their angel kitties at RB. The Cat on My Head has a Friday Flashback about angel cat, Skooter. The Cat on My Head posts a ’90s Christmas flashback to cat #3, Daphne. 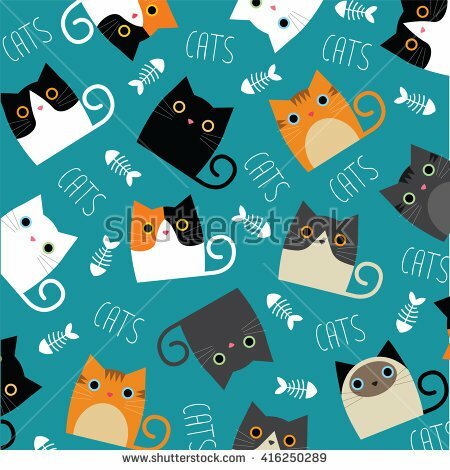 Kitties Blue list 8 Xmas items for which Q.C. is their responsibility. 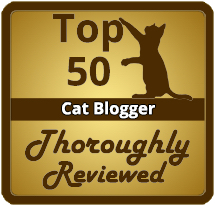 The Cat on My Head participates in the Friendly Fill-Ins blog hop. The Cat on My Head thanks Hill’s Pet Nutrition for sending Lily swag.